The future is governed through a genetic hierarchy—superhumans at the top, humans and defects at the bottom. Welcome to an all-new military science fiction novel from critically-acclaimed author Shami Stovall. Clevon Demarco, a genetically modified human, has a cocksure attitude and the combat skills to back it up. With his unparalleled skills, he makes his living as a ruthless gunrunner on a shady space station near the edges of the quadrant. Stronger, faster, and wittier than most sad sacks, no one even comes close to Demarco’s abilities—until he crosses paths with the captain of the notorious Star Marque, Endellion Voight. Captain Voight arrests Demarco and offers him a choice: go to a prison planet for his crimes, or join her starship, the Star Marque, working as mercenaries for the superhumans. But she didn't pick him at random. She has a plan to become a planet governor; a title no human has held since the superhumans won the war. It doesn’t matter the cost—assassinations, extortion, blackmail—she’s determined to claw her way to the top. All Captain Voight needs is Demarco’s help to carry out her machinations, and she’ll give him everything he’s ever wanted in return. 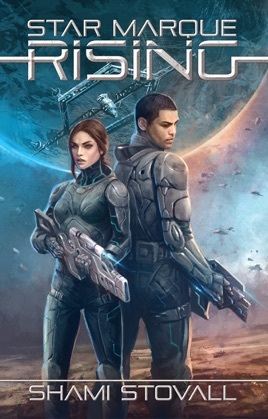 A fast-paced space opera for those who enjoy Old Man’s War by John Scalzi, Revelation Space by Alastair Reynolds, or anything by Robert A. Heinlein. I had never read anything by this author before, but I’m glad I picked this up. It was an awesome story with a lot of twists, great characters, and a wild ending. I would totally recommend it.